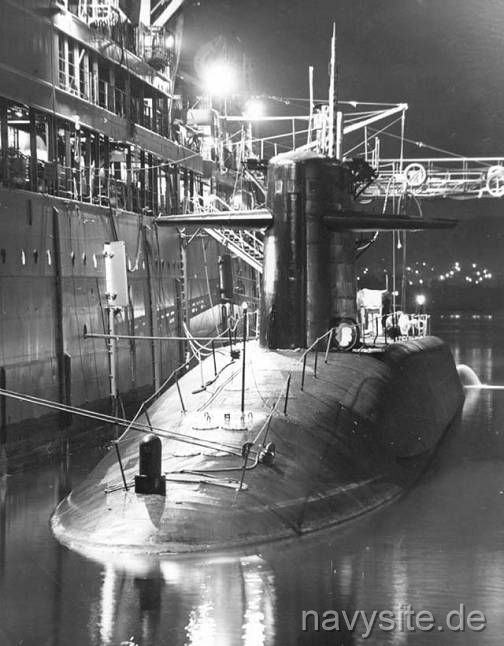 USS JOHN ADAMS was one of the LAFAYETTE - class nuclear powered fleet ballistic missile submarines and the second ship in the Navy to bear the name. The first JOHN ADAMS was named for the second President of the United States while the second JOHN ADAMS (SSBN 620) was named for both him and his son, John Quincy Adams. Built and designed to deploy the Polaris A2 missiles, the JOHN ADAMS received an upgrade to accommodate the 2500-mile range Polaris A3 in 1968-70 and was refitted with the Poseidon missiles by 1978. Decommissioned and stricken from the Navy list on March 24, 1989, the JOHN ADAMS spent the next years berthed at the Puget Sound Naval Shipyard in Bremerton, Wash., until she was disposed of through the Nuclear Powered Ship and Submarine Recycling Program. Recycling was finished on February 12, 1996. This section contains the names of sailors who served aboard USS JOHN ADAMS. It is no official listing but contains the names of sailors who submitted their information. 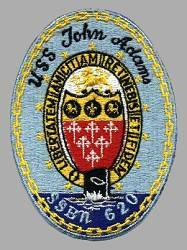 Click here to see which USS JOHN ADAMS memorabilia are currently for sale on ebay. June 7, 1963 Portsmouth Naval Shipyard, Portsmouth, NH. USS TINOSA (SSN 606) collides with the USS JOHN ADAMS when a tug towline snaps while the TINOSA is moved in the Portsmouth Naval Shipyard. TINOSA suffers a small dent below the waterline in the bow. John Adams was the first Vice President of the United Stated serving under Washington from 1789 to 1797 when he became the second President. Difficulties with France during his administration prompted him to push vigorously for construction of the Navy which had been neglected after the treaty of Paris. Defeated for reelection in 1800, John Adams retired from public life to Quincy, Mass., where he died 4 July 1826, coincidentally both the 50th anniversary of the adoption of the Declaration of Independence and the day of Thomas Jefferson's death.